The stock market lost over $1 trillion in value today -- almost $3400 for every person in the country. Here's the press release. It carried a dummy payload of 165 kg. The launch vehicle cost $7.9M. The space shuttle will be shut down in 2010.... Are we reaching a point where only private companies can now do what the mighty US government was once capable of? LHC Webcams... or, at least they were. "Capitalists can buy themselves out of any crisis, so long as they make the workers pay." "Who would have dreamed that when socialism finally came to the U.S.A. it would be brought not by Bolsheviks in blue jeans but Wall Street bankers in Gucci loafers?" This is known as Pharaoh's serpent, and used to be used in fireworks. Except the reaction products are highly toxic. I am listening to the presidential debate via the NY Times site (C-SPAN's site is completely hosed). And I've been looking periodically at Kevin Drum's MoJo site which is liveblogging the debate. I have never tried to follow any "live-blogging" before. It seems completely useless. I have no read one comment by Kevin that has added anything to this debate. It's hard enough to listen to the debate, carefully, and understand and follow what McCain and Obama are trying to say. Listening to it with one ear and looking at these other blogs for snarky comments just breaks up my concentration and detracts from the experience. It certainly does not add to the experience. All this liveblogging, twittering, and such is going to ruin us, I'm afraid. I'm perfectly willing to listen to the debate now, and then read the analyses later. I don't need both at once. I can't use both at once. Kevin: listen to the debate. Decide what you want to say. Then give us your valued perspective. I don't believe you can multitask the debate (listening + blogging) anymore than I can (listening + reading). Let's try to value thought over immediacy. In the debate, McCain just complained (again) about a $3M study of the DNA of bears in Montana. This is the problem?? Not, perhaps, hundreds of billions of dollars of spending or hundreds of billions of dollars in corporate welfare? I'll bet that what we learn from the bear genome will, in the long run, be worth far more than 3 cruise missiles. The future of medicine and this entire century is DNA -- everywhere. The more we know about DNA the more diseases we're going to solve, from diagnosis to (someday) genetic engineering. PS: Sarah Palin requested $3.2M to study harbor seal DNA. "If you're a young person looking at the future of this planet and looking at what is being done right now, and not done, I believe we have reached the stage where it is time for civil disobedience to prevent the construction of new coal plants that do not have carbon capture and sequestration," Gore told the Clinton Global Initiative gathering to loud applause. Well, OK, maybe. But such a call would have much more heft if Gore himself were willing to take part in this civil disobedience, even to lead it. Martin Luther King Jr. wouldn't have gotten very far if he'd only called for revolt and not lead it. Gore is someone who could truly gather large numbers of protesters willing to go over the line, if he were willing to take the same risk he's asking of others. Without that, it comes across as somewhat of an empty, easy gesture. 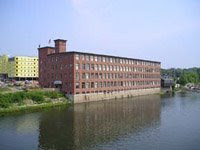 Several years ago I lived in Winooski, Vermont for awhile, a nice little town just across the Winooski River from Burlington. It was a charming little town, and cold. Perhaps it was because we couldn't afford much heat that winter. Anyway, today I was reading the 2009 Old Farmer's Almanac, and saw a reference to a proposed dome over Winooski. It turns out that in the last '70s the town was seriously considering placing a 200 ft high dome over 850 city acres. They obtained some preliminary grants, and did a lot of planning, but then the Reagan administration came along and put an end to all of that. It was probably a dumb idea, but visionary. In fact, it was a dumb idea. Half the charm of Vermont is its deep winter cold. If you're not up for that, you're probably not up for Vermont. McCain has famously admitted he does not use a computer, and some of his backers have suggested this is because his hands are damaged from his 5.5 yrs in captivity. And perhaps they are right -- I don't really know. So why has that kept him from exploring and understanding the Internet and Web, the most important technological innovation of the last 300 years? Many people are, unfortunately, in his position, paralyzed or without complete motor control. They've adapted to the Internet by learning about voice recognition and other such technologies. One of the most disturbing aspects of this electoral session is the strict control being placed over the candidates and their unavailability to the press. And I mean on both sides, though mostly on the R side. And mostly with Palin. An absolutely untested person who could be President in a few months, and they won't even let anyone ask her a question about more than moose burgers. Charles Gibson and Sean Hannity don't count, of course. In fact, that's what's so incredibly sad and disturbing about all this. Just one legitimate journalistic organization has had access to Palin, and beyond a little squeamy trap on the "Bush doctrine," nothing came of it at all. So sadly, this seems to be the future of our democracy. And let the wind kiss your hair? But you didn't feel scared? -- Wild Sweet Orange, "Either/Or"
I see tonight that Adam Riess of the Space Telescope Science Institute in Maryland won a MacArthur Genius grant for $500,000. Which is great for him. But it must have been a tricky decision. Saul Perlmutter ('s group) and Adam Riess ('s group) went head-to-head in discovering the acceleration of the expansion of the universe, and to date both have received nearly equal recognition of it (for example, they shared the 2007 Gruber Prize), and I think it's generally acknowledged that, if a Nobel Prize is given to this discovery (and it most probably will be), both would share it. This is one of the first asymmetries in their recognition. PS: I wrote a profile of Saul Perlmutter that appeared in this April's Scientific American, and Robert Kischner (from Harvard, of Reiss's group) and I had an exchange of comments in the August issue of SciAm. I looked into this issue of priority a good bit, and thought that Kutner's own interpretation of "Getting it First" (Perlmutter) versus "Getting it Right" (Riess) was pretty much right, if perhaps a bit slanted towards Riess and away from Perlmutter. Though I didn't interview Riess and I admit it's a very tricky, touchy subject. Lots of fodder for future science historians. There is a movement throughout the nation and the world to stop primate experimentation, as well as give primates some legal rights to bodily protection. Spain passed a law giving certain primates legal rights and several European countries have outlawed using primates for medical experimentation. Though the animal rights movement calls for the abolition of all animals exploitation, much of the current focus is on giving non-human primates freedom from imprisonment, torture, agony, and finally death after using them in frivolous and repetitive experiments. Last night I was reading Matt Ridley's book, Genome. He wrote that chimpanzees have more DNA in common with humans than with Gorillas. We have one less chromosome than them, but only because two of their's fused to make one of ours (#2). We have the same number of teeth, exactly the same lobes of the brain, and every chemical found in the human body is found in chimpanzees, and vice-versa. Is this 2% DNA difference sufficient to justify using them as we see fit? If so, would a 1% difference be? 0.1%? A couple of months ago I tried to get an interview with researcher's at OHSU's National Primate Research Center. I offered them complete anonymity and anything else they wanted, but they quickly turned me down. I understand the medical side of primate experiments, and it raises good questions, but so does their treatment and I just wanted to have a bare, straightforward talk about what all this means and how they make sense of it. No dice. 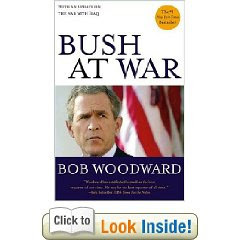 I just finished reading Bob Woodward's 2002 book Bush at War. Do not waste your time on it. It might thrill a couple of irretrievable wonks who care about a couple of arguments between Cheney and Powell and the boring, petty day-to-day power struggles about who's up and who's down, but it is largely a sycophantic book that unrealistically portrays every principal (Bush, Rumsfeld, Cheney, Rice, and Powell) as all-knowingly wise, patriotic, righteous, and democracy-minded. Point: Woodward writes about the entire lead-up to the Iraq War and does not even once mention the word "oil." I highly suspect that Woodward had to trade these pretty portraits for access. The Bush Administration told him only what they wanted to know, and so his claim to some kind of insider status is thoroughly unconvincing. And -- completely unlike a younger, hungry Woodward would have done -- he acquiesced in flattering portraits just so he could get a couple of hours talking with the President at Crawford or look at some memos that went through the West Wing. Even the dialog is stilted and unconvincing. A sickening kind of display that hardly seems to have the truth fore front. I guess that's the Washington game. Too bad even Woodward had to give himself to it. Hadley's released their August global temperature anomaly:+0.395°C. That's warmer than last August (2007), and essentially the same as last month. NASA GISS's value for August was (for once) essentially the same: +0.39°C. -- from a recruiting poster by British explorer Ernest Shackleton for his 1914 Antarctica expedition. I wish the press would stop referring to the LHC as the "Big Bang" machine, or say that it's recreating the Big Bang. Of course, it's doing no such thing, and it gives the impression that it will somehow tell us what the Big Bang was, and it skips over huge amounts of unknown physics that lies between the LHC and the Big Bang. The LHC has an energy of about 10 TeV, which particles had at about 10-11 sec after the Big Bang. The entire time before that is still largely unknown and very, very interesting, and there will need to be bigger colliders built to explore it. And even those won't "recreate" the Big Bang. I'm trying something new: an Internet-based radio/podcast show, called (what else) "Quark Soup Radio", at QuarkSoup.net. My first guest will be Michael Mann, climatologist at Penn State University and originator of the famous "hockey stick" view of 20th century global warming. We'll spend a half-hour talking -- about his latest research, about his travails surrounding his research over the last 5 years, and also about his background, life, and motivations for becoming a scientist, and his other thoughts. And who knows what else. I'm aiming to premier on Thursday, October 2nd. It will be a blog format, with lots of opportunity for comment and feedback. I'm very open to suggestions for future interviews -- write me at appell@nasw.org . I'd like to cover all fields of science, and some technology, too. And perhaps some science fiction. And whoever else I (or you) find interesting. If you're a scientist or agent with a book to promote, write me. Initially, I'd like to do an interview every two weeks, at first, eventually moving to one per week if I can swing it financially, salary-wise. The costs of hosting the show are small -- what costs is my time for preparation of the show. I'm a self-employed freelancer, always on the edge financially (but not complaining, really -- I'm lucky to do what I do), just trying to keep up with the future, so while I'm curious to see how this might develop, I may need to ask for donations at first, if you're willing, if you find it worthwhile, to cover a day or so per week of my time for preparation and interviews. If you want to hear today's scientists talking about their current research, and about what science means to them, and what they mean to science. I think we need to hear more about where people are coming from. Want an example? I've profiled six scientists for Scientific American, and I interviewed author T. Coraghessan Boyle several years ago, alongside the pool at the Ritz Carleton Hotel in Phoenix, Arizona. Stay tuned for more information soon. Thanks. I am not really that much into Israeli politics, except to say that doesn't Tzipi Livni have perhaps the coolest name in the history of humanity? There is nothing about it that is not excellent. And, often times in the past I wish I were an Israeli citizen, out of respect for their sense of community, their respect for knowledge, and their inherent, proud sense of will. She might turn out to be a lousy Prime Minister, but at least she is Tzipi Livni. Actually, a lot of Israeli names are pretty spectacular -- a prerequisite for a hardy civilization, and something America (and most countries) mostly lacks. Everyone is talking about the current financial crisis, with banks and mortgage companies collapsing, because they wrote unwise loans allowing people to overextend themselves and take mortgages they couldn't really afford. OK. But I have yet to hear anyone say why these people suddenly couldn't afford their mortgages, and it seems to me it's at least partly because of the steep increase in the cost of energy in the last year, especially oil, which took awhile to permeate through the markets to affect food, manufacturing, and other industries. Energy really isn't something you can go without, so they had to cutback somewhere/everywhere. I'm not an economist so maybe this is wrong-headed. But in the last several days I haven't even heard any mention of it, when to me the run-up in oil prices is one of the most significant economic factors of the decade. And -- if we really are at Peak Oil -- a small sign of the larger nastiness yet to come. John McCain has a 20% chance of dying before his first term would be complete, and a 44% chance of dying before the end of his second term. At least, that's my best calculation according to actuarial tables. 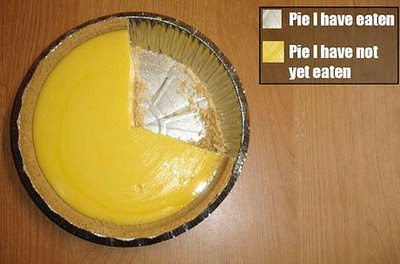 I'm not an expert at these kinds of calculations. And it should certainly be acknowledged that no one individual life is is actuarially accurate -- there are too many variables relating to genes, life experiences, diet, medical care, etc. In fact, I highly suspect these variables overwhelm any error I might have made in my calculation above. Mortality tables are used to project the life expectancy potential of large groups of people of the same age and gender and are not meant to predict the life expectancy of one particular individual. There are hundreds of additional questions involving family history, medical history, lifestyle decisions, etc., to which we cannot possibility know all the answers. And even if we did know all of the risk factors for a particular individual, some aspects of mortality are simply random. Therefore it does not make sense for us to try to look at a table and predict one person's life expectancy. Fair enough. But, of course, many companies do exactly this -- apply actuarial tables to individuals. Isn't that the whole point? I am between apartments at the moment, though next week I'll be moving to St. Helens, OR, to a little bungalow near the Columbia River about 30 miles north of Portland. So I've had access to a television in the last few days, and have been watching the Republican Convention. I don’t know -- I am so cynical anymore that I have a hard time taking the party Conventions seriously. I have a difficult time taking any politics seriously, and I honestly don’t understand why the Internet and the networks and the country as a whole are so taken with it. They’re just getting fooled again. What really changes? Very. very little is going to change. Corporations will still be controlling our government after McCain’s administration, or Obama’s. The rich will get richer. We will still spend an utterly obscene amount of money on the military in the guise of defense, but, of course, it’s all about securing oil and its profits and large contracts for defense companies who have no morals except obtaining the height of their bottom line. John McCain paints himself as a “maverick,” and he’s voted with Bush 91% of the time. And the press dutifully reports this as his reputation. If Gore had won the presidency in ’00, would much be different? There’d be more emphasis on climate change, but I honestly doubt much there would be different. The Senate voted 97-0 against Kyoto in 1997, and that’s not reversible in a few years. The Republicans now only want to drill, drill, drill, and have not the slightest regard for greenhouse gas emissions. Future historians are going to look upon this time with astonishment. We wouldn’t be at war in Iraq -- probably. I’m not really sure. Gore would certainly have been susceptible to the special interests that demanded this war. He would still be president of a country in a world running out of oil, with 300 million people demanding they be able to fill their gas tanks, even at $4-6/gal. In this day and age, when Exxon-Mobil comes knocking on the door, one of the most powerful corporations in the world -- if not THE most powerful corporation in the world -- it is not clear to me that you can say no, despite your campaign rhetoric. And it’s all now so personality-driven. And the networks fall right into this line. That is -- literally -- all Sarah Palin talked about Wednesday night. It’s abundantly clear that she has no vision -- none whatsoever, as if they’re counting on her being a GILF is now sufficient for executive office. Keeping her secluded from the press for two weeks is the utmost of cynacism. The Republicans are all about drill, drill, drill, and there isn’t one word -- not one -- about the GHGs being added to our atmosphere. It’s like they’re trying to ignore the basic laws of gravity. And where is the discussion about health care, health insurance, the Iraq War, global warming, the increasing gap between the rich and the poor, our deficient infrastructure, our energy crisis, the corporate control of America, our national decline? She says she will be an advocate for families with “special” children. What does that mean? Will they have taxpayer-paid health insurance? All the therapy they need? Or is this just lip service? The media -- the damn media -- is so completely useless and vapid and stupid and utterly inconsequential that the McCain camp considers a few direct questions about Sarah Palin’s decision-making as commander of the Alaska National as “over the line.” On Thursday night Charles Gibson from ABC news spent ten times more effort worrying about whether all the balloons would fall onto the convention floor than anything of substance that anyone had to say. Is the media this bad because their audience demands it, or is the audience so numbed because the media has no clue? And isn’t it interesting how Sarah Palin’s sexual life is “private” when Republicans like nothing more than to pry into the sexual lives of gays, pregnant women, and the unmarried singles. All of THOSE are discussable -- but the actual pregnancy of an unmarried high school student isn’t. Just some thoughts. Looking forward to getting back to work.